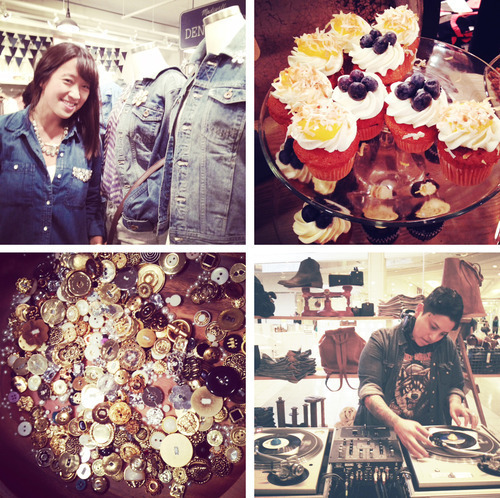 Happy 1st Birthday, Madewell San Francisco! I left with a homemade brooch, a fresh pair of white jeans, the color-block Skimmers I’d been eyeing forever and a nifty denim polka-dot tote. Last night we celebrated Madewell’s first anniversary in San Francisco with local cupcakes and cookies from Bi-Rite (which is also the purveyor of some seriously obsession-worthy ice cream), California microbrews and D.I.Y. crafting with Bay Area blogger Erica Chan Coffman of style site Honestly WTF. The coolest part? A crafts table stocked with glue guns, tulle, charms, buttons and jewels that allowed us to tap into our inner fashion designer. Erica gave D.I.Y. tutorials on bedazzling everything from shorts to jackets to denim shirts. Between my shopping high and sugar rush, it was a great time indeed. 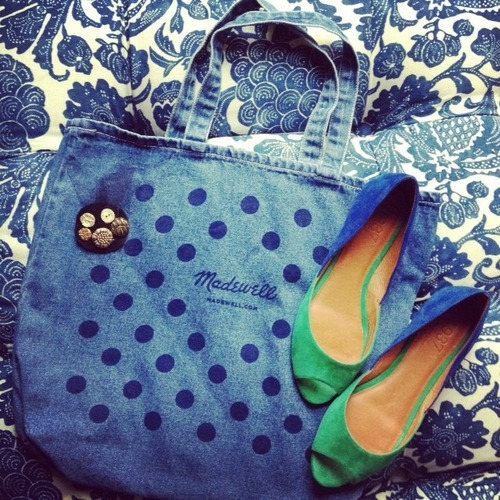 This entry was posted in Uncategorized and tagged emily hsieh, madewell, san francisco. Bookmark the permalink.